How to trade IBEX-35 ? Several of the world’s indices are available to trade through online trading platforms. These provide an excellent means to trade on a diversified asset that is heavily influenced by market sentiment and major economic indicators. 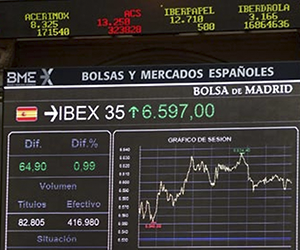 The IBEX-35 index comprises 35 of the biggest companies on the Madrid Stock Exchange in Spain. It was established in 1992 and is run by Sociedad de Bolasas. Stocks are analyzed and subject to amendment bi-annually. It is a market value-value weighted index. As with all of the major indices, there is tremendous volume traded on the IBEX-35. The instability of the Spanish situation has increased volume as traders seek to profit from the fluctuations that news and sentiment provide. Online trading traders can use this index to seek out huge profits on a consistent basis. There is abundant information, expert opinion, technical analysis and signal offerings for this index. The opportunities for profit are there through a well thought out strategy. Abengoa, Abertis, Acciona, Acerinox, ACS, Amadeus IT Holding, ArcelorMittal, Banco Popular, Banco Sabadell, Banco Santander, Bankia, Bankinter, BBVA, BME, Caixabank, Dia, Enagas, FCC, Ferrovial, Gamesa, Gas Natural, Grifols, Iberdrola, Inditex, Indra, International Airlines Group, Mapfre, Mediaset Espana Comunicacion, Obrascon Huarte Lain, Red Electrica, Repsol YPF, Sacyr Vallehermoso, Tecnicas Reunidas and Telefonica. The sectors represented by these companies include telecoms, oil and gas, finance, construction, logistics, media, manufacturing, fashion F & B, electronics and mining. Online traders can use the IBEX 35 as an excellent opportunity to trade the Spanish instability while getting to know the companies on the index. Many of the companies provide good prospects for specialization in an individual stock and trading an index can be an excellent way to introduce oneself to different companies. Want to know where to trade IBEX 35 online trading?